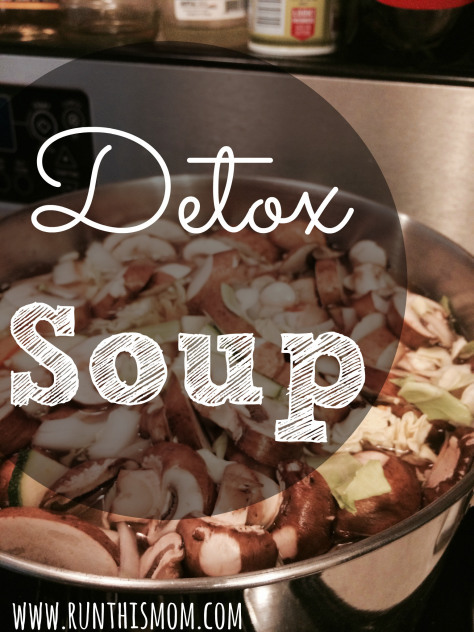 I was just googling for recipes of detox soups and stumbled upon this blog. Not only is the recipe looking really simple, good and – freezer-friendly – it is written by an amazing woman! Go to her “about” page and read about her, it really is very moving and motivating. I found this via Pinterest, for use for a 4 day detox where you only eat this…but that is just not healthy. (fads bad, clean eating good) But I thought the soup sounded really yummy. So I made a HUGE batch of it yesterday. All of the ingredients are nice and healthy, and if you purchased organic, and minimally processed ingredients (The lentils and beans), this is a perfect clean recipe! You can add more veggies, just no starchy veggies (potatoes).